Liberia’s Central Bank acted “unilaterally and unlawfully” by printing and importing into the country three times the amount of banknotes it had been authorised to do, a US-contracted international investigation has found. The Liberian government – with pressure from civil society groups – contracted Kroll Associates, a leading investigative and risk-management firm who was hired to track down Saddam Hussein’s assets following the Iraq War. The much-anticipated report, released by the US embassy, was looking into the alleged disappearance of $100m (£75m) worth of newly-printed Liberian banknotes last year. The report did not find any proof that an actual container full of banknotes had vanished, as had been widely alleged. But the country’s Central Bank, which had received new banknotes in a total of 20 shipments, was not able to properly account for the money. The bank was also unable to explain and present proper documentation on how the money was infused into the Liberian economy, the report found. 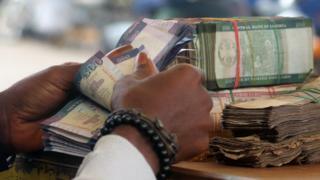 Critics of the George Weah government have been accusing his administration of having a hand in the poor handling of the consignment of banknotes – an allegation the administration has denied. The report points to widespread inconsistencies, lack of proper documentations and explanation and “gross disrespect for money-ordering policy”. How much money was ordered? According to Kroll, the House of Representatives passed a resolution for the order of 5bn Liberian dollars to remove and replace old banknotes on the market. The Central Bank requested additional 10bn Liberian dollars but the request was denied by the Senate. The bank went ahead anyway and engaged a company to print the additional banknotes. “CBL (Central Bank of Liberia) management subsequently explained to Kroll that due to the urgency for new banknotes, the CBL did not follow its own internal tendering policies for the procurement of Crane AB,” the report says. Kroll explains in the 67-page report that, despite repeated requests, the bank did not provide any explanation as to who approved the injection of new banknotes into the Liberian economy without first removing the equivalent quantity from circulation. The US embassy says the report indentifies “systemic and procedural weakness” at the Central Bank and suspects shortcomings in the country’s fiscal and monetary management processes continue to this day. The result of an investigation launched by the Liberian government itself in September 2018 into the matter was submitted to the office of the president on 7 January, but is yet to be published.